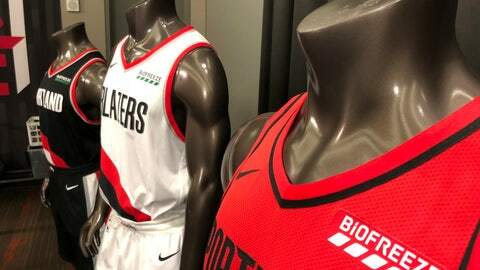 A logo for the company’s product Biofreeze will be featured on the left shoulder of Portland’s uniform. With the deal, the Blazers become the 24th NBA team to include a corporate sponsor on its jerseys. Biofreeze is a topical pain reliever. Snowboarder Shaun White and tennis player Sloane Stephens are among the product’s individual athlete endorsers. The NBA first allowed jersey sponsorships last season. Trail Blazers President and CEO Chris McGowan said Portland was close to a deal last year but it fell through, prompting the team to take a “step back” from the process. “We took our time as it relates to finding the perfect partner to put on our jersey, and what we loved about this was that it was all about healthy living,” McGowan said. The Biofreeze logo will also be featured on the team’s practice apparel. Terms of the deal were not released. “We look for partners who share our values, share the same commitment to helping people achieve their own personal goals and really a strong commitment to health and wellness,” McGoohan said.